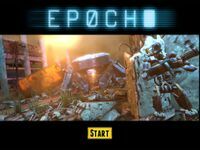 EPOCH is a cover-based third person shooter set in the aftermath of a widespread robot uprising. The player controls Guardian, a robot that reboots in a wreckage-strewn battlefield, recalling orders to protect Princess Amelia. Each stage represents a single firefight in a wartorn urban environment, with Guardian squaring off against the rogue robots of the Omegatroniks Corporation. Firefights are scored on efficiency and damage (player health), with a better score providing more credits with which to purchase a wide range of upgrades. Players are also rewarded with salvage and with intercepted data fragments that build a narrative context for the game. EPOCH's upgrade system and approach to in-app spending are both modeled heavily on the Infinity Blade series, though the core gameplay mechanics are different. In turn, EPOCH heavily influenced Mass Effect Infiltrator, which uses the same targeting and cover-switching as well as a very similar scoring system and in-game economy.